These remarkable coins from the 18th and 19th century were issued by the Dutch East India Company, the world's first multinational corporation and the first company to issue stock. The authentic coins are mounted on a three prong sterling setting. Gift box includes signed certificate of authenticity. A great gift for seasoned or budding tycoons! 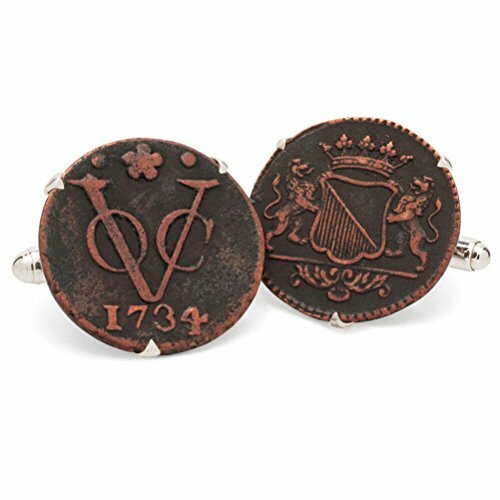 Given the unique nature of this product, cufflinks may differ from the sample image shown. If you have any questions about this product by Tokens & Icons, contact us by completing and submitting the form below. If you are looking for a specif part number, please include it with your message.